Second QI Fundamentals webinar, done (and the next one is tomorrow). We have all asked ourselves "what do I want to improve?" and our answers became the foundations of our ALOs. The next step was to formulate SMART (specific, measurable, attainable, realistic and time-bound) aim statements. I shared my aim statements with you in my last post. But I'll post them just below too. There are actually two aims in there. Do you think they're SMART? My ALO as posted in the QI Fundamentals forum on the ICN Exchange. The Exchange is an internal knowledge-sharing platform, which ImproveCareNow uses to enable our participants to 'all teach and all learn', so we can improve care now. The answer is yes. I've focused my project on a very specific target area (this blog) and I have measurable goals (add 4 new contributors, and increase weekly posting to 100%). I chose LOOP because I am the managing editor (so completing this project is well within my ability, or attainable and realistic), and it was easy to make it time-bound because the end date is September 4, 2014. That's the date of our Fall Learning Session, where my QI Fundamentals comrades and I will present the results of our ALOs. Now it's time to set up run charts and see how I'm doing (and have something to show on September 4th). A run chart is a basic charting tool that displays variation over time. They are often used by professionals in quality improvement because they track the impact of changes on measures. A run chart can help someone like me (who is definitely no statistician) present my data in a way that tells the whole story. 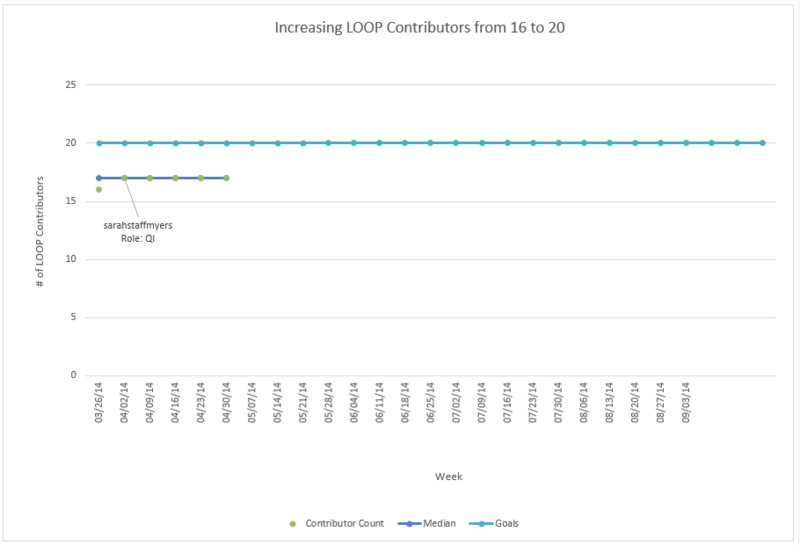 Maintaining a run chart is a good practice because it keeps me in touch with my data and ensures I am reviewing it in real-time so I can understand objectively if the changes I make (to my recruiting process) lead to an improvement (new LOOP contributors!). So instead of just observations or gut-feelings, I can rely on my data to support decisions about whether to adopt, adapt or abandon a certain change or intervention. As you can see in my run chart (above) I have added one new contributor since beginning the test (NOTE: I had to adjust my baseline because my starting number of contributors was 16, instead of 17) . Sarah Myers is the Executive Quality Director for ImproveCareNow. Looking back at my aim, you'll probably recall that I said I was going to add a clinician, research/improvement coordinator, dietitian and nurse contributor to the roster. How am I using the run chart to also track contributor roles to see if I'm achieving the qualitative part of my aim? Data labels. To add a data label in Excel: click on the data point you want to label (making sure no other points in the series are highlighted), right-click, then select "Add a Data Label". So, I have a question for you: What constitutes a contributor to LOOP? This is my thinking: a person who has accepted an invitation from LOOP to create or use an existing WordPress account and be assigned a user level of Contributor or higher; once the Contributor invitation is successfully accepted, the user must contribute at least one post. One post. Is that enough? If not, how many? If I want to add more contributors to LOOP, what changes should I test? I'm thinking of putting an ad in the ImproveCareNow Digest - an eNewsletter sent to all our participants - asking for volunteers. Do you think this will yield anything? Do you think I have to get more personal and approach people 1:1, especially if I want to meet my diversity goal? If I asked you to contribute to LOOP, what would you need from me to help you make your decision? I'd be interested to hear your thoughts.